It’s 7am and I’m standing on a beach in the early morning sun doing chi gung with Master Faye Yip. A sense of calm falls over the group as we follow the flowing moves of the Ba Duan Jin. It’s my first time at the International Aquavenice seminar, and I’ve quickly settled in. This time yesterday I was sat at Gatwick airport, armed with waterbus timetables and detailed instructions of how to get from Venice airport to the Pellestrina. A daisy-chain of boats and buses get me along the islands that create the lagoon until the road comes to an end and the only way to achieve the last leg is by boat. With no traffic, Ca’ Roman, the venue, is idyllic with the lagoon on one side and the beach and sea on the other. Turning up on my own to an overseas event had felt a little bit daunting, but I was warmly welcomed. Watching others arrive I soon realised from the way they greeted each other that for many people this was an annual event for them. And by day two I was beginning to understand why. Attracting high-calibre teachers from across Europe. like Master Faye Yip and Luigi Zanini, alongside the expert teaching of the Masters and teachers at the Tai Chi Research Centre in Venice. brings together some fantastic learning opportunities – chances to hone existing skills and to try something completely new. Whilst many of the participants come year after year, being a newbie I never felt out of my depth. Sessions were arranged with groups for novice, intermediate and experienced practitioners; enabling everyone to get the most out of each session. Qigong before breakfast and two sessions before lunch sounds intense, but this is Italy where they invented la dolce vita! Lunch is leisurely three-course affair with carafes of wine on the tables, then it’s free time, so off for a lie down, a bit of practice or grab your towel and head for the beach until the pre-dinner session kicks off. Aquavenice provided a wonderful blend of hard work and relaxation; from Biospirals chi gung to weapons forms the event was beautifully balanced, with something for everyone. There was also a real warmth (and I don’t just mean the weather!) which drew me in and made me welcome so that I ended up feeling like part of a family. 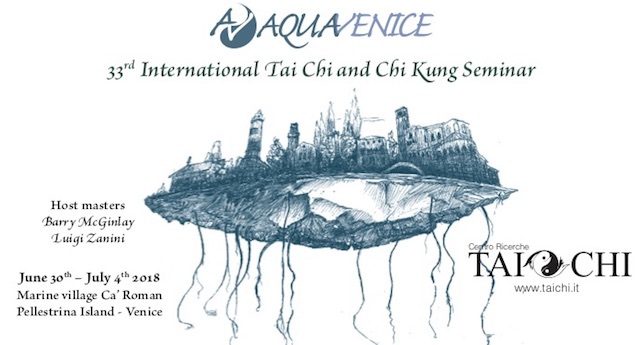 This year’s programme has Barry McGinlay and Luigi Zanini are guest Masters for the 2018 Aquavenice seminar along with some exciting sessions taught by the the Tai Chi Research Centres’ experienced Masters – Biospirals Chi Gung, long stick, fan form, Xuan Chuan and Tui Shou. It’s already shaping up to be another not-to-be-missed event.